May 10, 2016 is Jordan’s Principle Implementation Day. 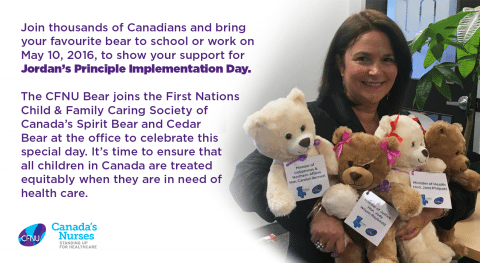 Teddy Bears were one of Jordan’s favourite things so the Canadian Federation of Nurses Unions (CFNU) has joined the Fist Nations Child & Family Caring Society of Canada to mark the day by bringing a our CFNU teddy bear to the office for the day. Bring your favourite bear to work or school today to honour Jordan and tweet pictures at #JordansPrinciple. It’s time to ensure that all children in Canada are treated equitably when they are in need of health care.